Feminism and sexism are two gendered frameworks for defining and analysing the roles of women and men in society and politics as well as other realms of human existence. While men have historically leveraged on their ascribed cultural and biological superiority to sustain their dominance in the political realm, the fundamental question of what should be the status of women—in relation to politics and governance—has remained largely unanswered. As a situation that characterises virtually all climes of the world, it has continued to dazzle the promoters of feminism who stress ‘the similarities between men and women and the entitlement for women to the same rights and responsibilities that men have’ (Kaarbo and Ray 2011, p. 20). The situation in Africa—the continent where Nigeria is located—is even more undefined and worrisome. Given the prevailing culture of patriarchy and other societal encumbrances, the feminists’ campaign for gender parity in politics and governance (and a greater appreciation and recognition of the role of women) has not yielded much fruits in the African context. The sexist orientation of key political actors—government officials, party officials and godfathers—has largely contributed to this state of affairs. Olalere, T.O. (2015). Women and Nigerian Politics: An Appraisal of 2015 General Elections. http://www.inecnigeria.org/wp-content/uploads/2015/07/Conference-Paper-Olalere-Titilope.pdf accessed March 10 2017. Oluyemi, O. (2016). Monitoring Participation of Women in Politics in Nigeria. https://unstats.un.org/unsd/gender/Finland_Oct2016/Documents/Nigeria_abstract.pdf accessed March 10 2017. Oshewolo, S. (2013). 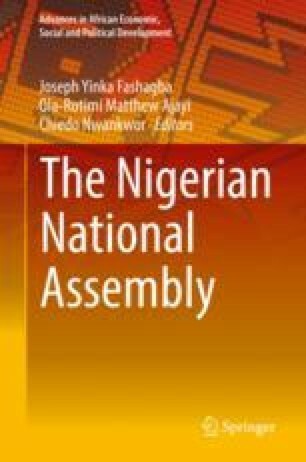 A Reconsideration of the Ethno-Religious Dimensions to Nigeria’s 2011 Presidential Election. https://works.bepress.com/segun_oshewolo/31/ accessed March 10 2017.